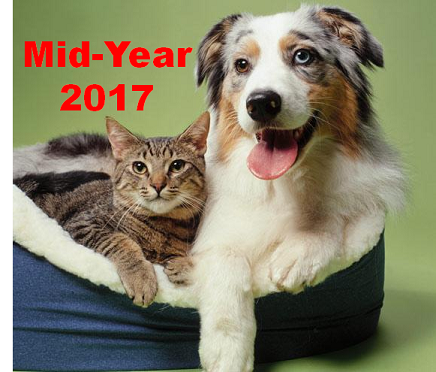 In our mid-year analysis of Pet Food spending, we saw a slightly negative number but discovered that this was primarily due to a carryover from the second half of 2016 and was masking a very positive start for 2017. 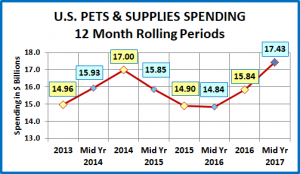 Pet Supplies spending tells a totally different story, and it is all positive. 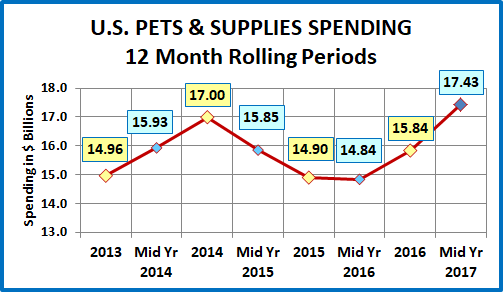 Mid-Year 2017 Pet Supplies spending was $17.43B, up an incredible $2.6B. Pet Supplies Spending last reached this level in Mid-Year 2013 and is higher than any annual number since 2010. The following chart should put the recent spending history into perspective. Like Pet Food, Pet Supplies spending is also on a roller coaster ride. However, the driving force is much different. Pet Food is “need” spending and is powered by a succession of “must have” trends. Pet Supplies spending is largely discretionary so it is impacted by 2 primary factors. The first is spending in other major segments. When consumers ramp up their spending in Pet Food, like upgrading to Super Premium, they cut back on Supplies. However, it can go both ways. When they value shop for Premium Pet Food, they take some of the saved money and spend it on Supplies. The other factor is price. Price inflation tends to retard sales, usually by reducing the frequency of purchase. On the other hand, price deflation generally drives Supplies spending up. There is also another factor that can “trump” both of these influencers – innovation. If a new “must have” product is created, something that significantly improves the pet parenting experience, then consumers will spend their money. Unfortunately, we haven’t seen much of that in this segment recently. In 2015, consumers spent $5.4B more on Pet Food. At the same time, Pet Supplies prices went up 0.5%. This was a “killer” combination as Supplies spending fell $2.1B. In 2016 consumers value shopped for Food, saving $2.99B. Supplies spending stabilized by mid-year then increased by $1B in the second half, despite price inflation of 0.6%. Consumers spent some of their “saved” money on Supplies. In December 2016 Supplies Prices turned downward and stayed below 2016 levels all year. Food spending increased $1.94B in the first half of 2017 but this came from a limited group. The result was that Supplies Spending had explosive growth, up $1.6B. Let’s look a look a little deeper at the “who” behind the big Supplies Spending increase. The Supplies spending was flat in the financially pressured <$30K group. Everyone else had an increase. With the exception of the lower middle income $50>$70K group, all of the increases exceeded $0.5B. The increases grew larger for groups with income over $100K. This is to be expected in discretionary spending. Once again, the increase is very consistent across age groups, with the exception of the 25>34 year old Millennials. Although the spending fell in the 25>34 group, we should remember that last year they were the only group from 25>75 to have an increase in Supplies Spending. On average their Supplies Spending has been consistent over 3 yrs. The Supplies Spending increase is remarkably well spread across both income and age groups. Mid-year sales numbers include data from parts of two calendar years. One of the priorities of this analysis is to determine how the latest year is starting out. Supplies’ Spending in the first half of 2017 was up $1.6B versus the same period in 2016. Our final chart will show the segments driving that big increase in key demographic categories.